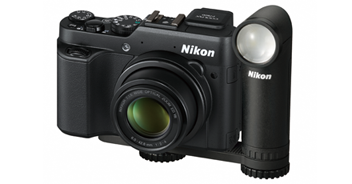 A compact LED light for Nikon 1 and COOLPIX cameras that can easily be used to light still images and movies recorded at close distances. 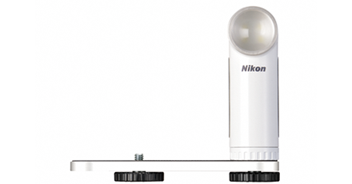 TOKYO - Nikon Corporation is pleased to announce the release of the LD-1000 LED light, an accessory for Nikon 1 advanced cameras with interchangeable lenses and COOLPIX compact digital cameras that expands the way in which users enjoy photography. *The bracket can be used only with cameras equipped with a tripod socket. The LD-1000 LED light is a compact and lightweight LED light with a stylish design that can conveniently be taken anywhere. The LED window has a diffusion panel that diffuses light, enabling natural rendering of textures with the smooth, soft light perfect for close-up still photography and the like. What's more, the degree and effects of continuous lighting can be previewed in the live view display, or the bracket can be removed and the LED light held in the hand for free control over the angle of lighting. These capabilities allow users to easily enjoy the benefits of lighting with photography. The diffusion panel on the LED window diffuses light for clear and consistent, soft light. It also enables natural rendering of textures with little glare off subjects with highly reflective surfaces. It is the perfect additional light source for close-up photography of still objects such as accessories and foods. As the LED light emits light continuously, rather than momentarily as a conventional camera flash does, the degree and effect of light as it strikes the subject can be confirmed in the live view display while shooting. Users can easily enjoy adding light to their photos without previous knowledge of special lighting techniques. Further, the LED light can also be used as an additional light source with movie recording, a process with which still frames are captured in rapid succession. The bracket can be removed and the LED light held in the hand for shooting or recording. This allows users to move the LED light away from the camera, adjust direction and height, as well as the distance of the light from the subject to achieve the optimal lighting angle regardless of the camera's positioning. Flexible control over the way in which light strikes a subject makes natural rendering with a three-dimensional feel possible. Shooting angle can also be adjusted when the LD-1000 LED light is mounted on the bracket. The bracket can be mounted on any model with a tripod socket. The single power switch on the back of the LED light can be used to turn the light on or off, and to specify output from two levels. Compact and lightweight with a stylish design that can conveniently be taken anywhere. Available in two colors, black and white. *Specifications, design, product name and supplied accessories may differ by country or area. Specifications and equipment are subject to change without any notice or obligation on the part of the manufacture. The information is current as of the date of publication. It is subject to change without notice.